New Ohio Theatre and IRT Theater are proud to announce that One-Eighth Theatre and The Drunkard’s Wife will join the Archive Residency in 2017 – 2019. Sunday, December 11, 2017 at New Ohio Theatre, from 7 – 9 PM. Each company will receive financial, administrative, and artistic support for two years as they develop a new work from inception to World Premiere. Join us for drinks, snacks, and mini performances from the artists. 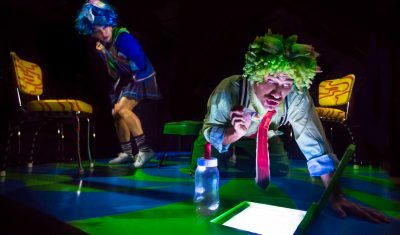 Founded in 2008 by Artistic Directors Daniel Irizarry and Laura Butler Rivera, One-Eighth Theatre, is inspired by Hemingway’s Iceberg Theory – the alluring idea that some things are better left unexplained or open to interpretation. The tip of an iceberg is only one-eighth of what’s there, so much more lies beneath the surface. This idea of abstract possibilities is applied to all things One-Eighth. One-Eighth currently had a four-year long residency at INTAR Theatre. From participating in soloNOVA’s theater festival to performing at IRT, from two Mabou Mines residencies to creating an original piece at Bilkent University with Turkish actors, One-Eighth is constantly pushing theatrical boundaries. Poland, Japan, United Kingdom, Lithuania, Germany, Turkey, Romania, Korea, Puerto Rico, New York City—One-Eighth also travels the world offering workshops and ‘breaking the ice,’ sharing their theatrical pieces.